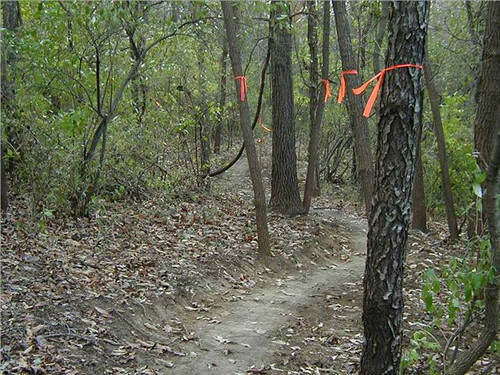 This trail system is made up of more than 7.5 miles of tight, twisty, all-dirt singletrack in 6 separate trails. Modest elevation gain, thick forest, and smooth hardpack make for rides which will satisfy every rider from beginner to advanced. 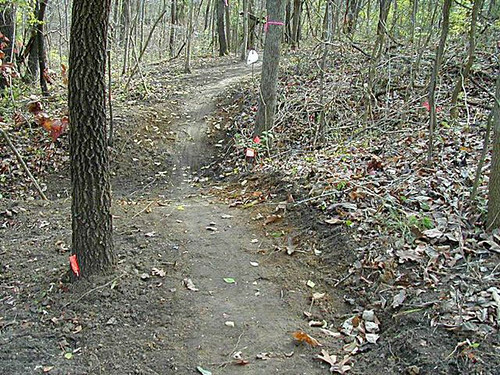 The trails were designed in such a way that they would be a place not only for beginners to try out mountain biking, but also to allow more advanced riders an opportunity to test their bike handling skills by riding the narrow trails at a more rapid pace. They are built partially on the site of an old outdoor amphitheater from the 1970's, better known as the "Mississippi River Festival." 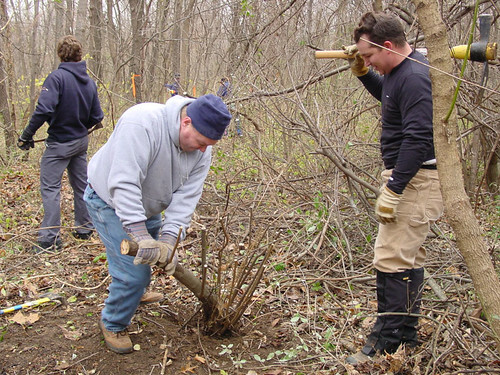 The trails are easily accessible from the numerous bike paths that intertwine the Metro-East, so if you live in the area, driving to the trails is not necessarily required. 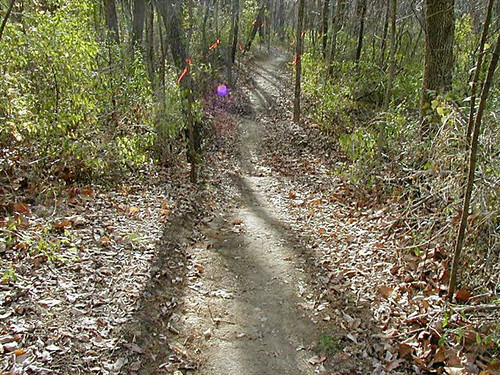 While all the trails are designed to IMBA standards, because of the all-dirt surface, it is recommended that you not ride these trails immediately following rain. 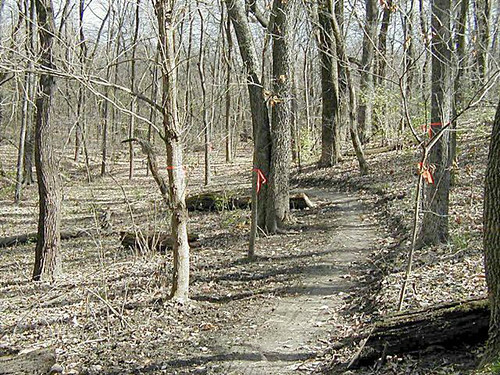 Please download a map and take it with you, so you will be able to find all the loops, as they are spread out among numerous cross-country running trails. Take hwy 255 North past Interstate 270, to New Poag Road. Turn Right or East at the end of the exit ramp. Stay on New Poag Road until the first intersection with a 4 way stop sign. This will be University Drive. Turn Right onto University Drive. The road will immediately bend to the left, at the end of the bend on your right is a gravel road, turn onto the gravel road. 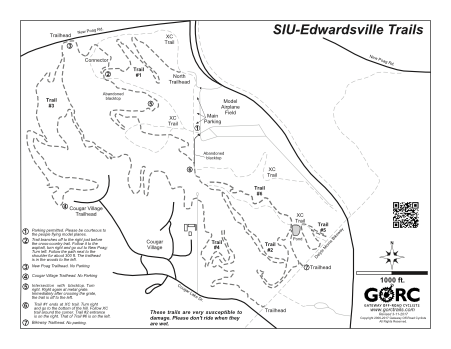 For those of you approaching by bike, there is a trailhead for Trail 2 off of the Delyte Morris Bikeway, which bisects the SIUE campus from Stadium Drive, and eventually connects with the Watershed Bikeway. The trailhead is in between Cougar Lake Dr. and University Dr., just to the east of campus. There is also a trailhead on Trail 3 at the back of Cougar Village behind the Northwestern-most collection of apartments. Small mud patch on trail 1. 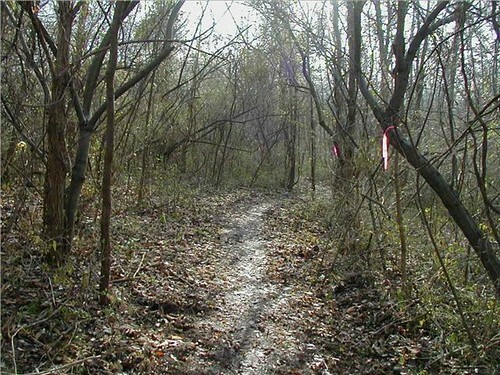 Usual spring mud pit on trail 4. Everything else is in great shape. Some seasonal mud, and a few trees down, but not enough to stop the fun. Tree down across Trail 3 just north of trailhead with Trail 4. Users have made an alternate path already. The dirt is really good except for the usual muddy spots. There is a tree down on 1 which you can duck under. The trails not directly attached are okay. There were some spots I had to get off and clear to the best of my ability. Ran SIUE this afternoon and about 1/4 of the tread was slimy and muddy. Maybe stay another couple of days but that probably won't happen with the predicted snow. Trails were pretty good, but sloppy. Need a hard freeze to set them up for winter riding.